Myers Spring Company, located in Logansport, IN, will be hosting an event for Manufacturing Day℠ 2016 on October 7th. Manufacturing Day is an annual celebration of modern manufacturing with events held throughout the United States, Canada and Mexico. 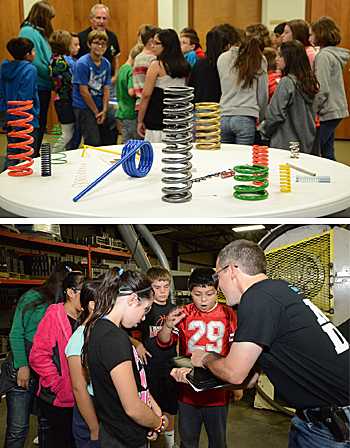 Myers Spring’s event is invitation-only and will include plant tours, manufacturing expo, presentations and more for schools in the community. Students and visitors will be able to interact with employees and learn how familiar products, such as pens, appliances and toys, can contain Myers Spring parts and springs as key components. Myers Spring Company produces quality, fine wire precision springs with wire diameters ranging from 0.006” to 0.750”. These springs are produced from a range of materials and are integral components for a variety of products, including high tech–precision instruments, military applications, industrial, automotive, agricultural equipment, appliances, toys and many other consumer products.